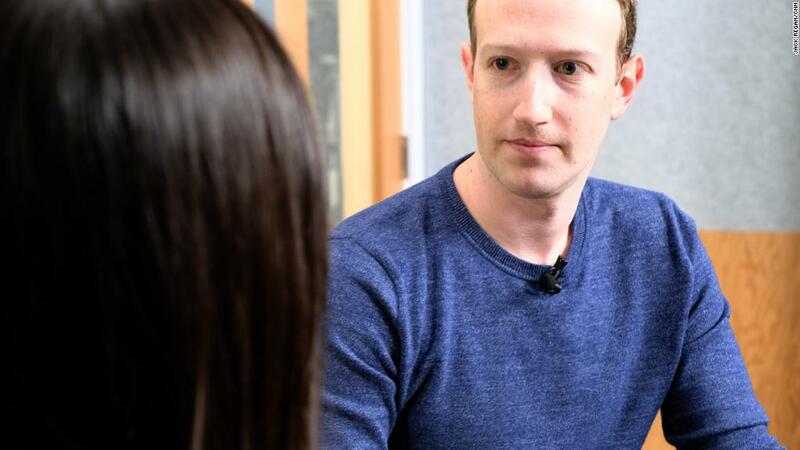 Mark Zuckerberg sat down for an exclusive interview with CNN's Laurie Segall on Wednesday, days after news broke that Cambridge Analytica, a data firm with ties to President Donald Trump's 2016 campaign, accessed information from 50 million Facebook users without their knowledge. Zuckerberg apologized for the scandal, discussed Facebook's efforts to prevent bad actors for meddling in the 2018 midterm elections and shared his regrets. Read excerpts from the emotional interview below. Laurie Segall: I'm gonna start with just a basic question, Mark, what happened? What went wrong? Mark Zuckerberg: So this was a major breach of trust and I'm really sorry that this happened. You know we have a basic responsibility to protect people's data and if we can't do that then we don't deserve to have the opportunity to serve people. So our responsibility now is to make sure that this doesn't happen again. And there are a few basic things that I think we need to do to ensure that. One is making sure that developers like Aleksandr Kogan, who got access to a lot of information and then improperly used it, just don't get access to as much information going forward. So we are doing a set of things to restrict the amount of access that developers can get going forward. But the other is we need to make sure that there aren't any other Cambridge Analyticas out there. Right, or folks who have improperly accessed data. So we're gonna go now and investigate every app that has access to a large amount of information from before we locked down our platform. And if we detect any suspicious activity we're gonna do a full forensic audit. Zuckerberg: We're going to review thousands of apps. So, this is gonna be an intensive process, but this is important. I mean this is something that in retrospect we clearly should have done, upfront, with Cambridge Analytica. We should not have trusted the certification that they gave us. And we're not gonna make that mistake again. I mean this is our responsibility to our community, is to make sure that we secure the data that they're sharing with us. Segall: Will you take legal action against Cambridge Analytica? Zuckerberg: Well the first thing that we need to do is actually understand what happened. So, you know, right now we have the report from the Times and the Guardian and Channel 4 that said that they thought that Cambridge Analytica might have access to data still. But the first thing that we need to do is complete our audit there... the short answer is that if we go in and find that Cambridge Analytica still has access to the data, we're gonna take all legal steps that we can to make that the data of people in our community is protected. Segall: Respond to the users who say you didn't get in front of it because we're here talking about it today. Zuckerberg: Well, clearly I wish we'd taken those steps earlier. I mean, that, that I think is probably the biggest mistake that we made here ... the feedback from the community and the world has overwhelmingly been, that, if you balance these two values of being able to take your data and some data from friends to be able to have social experiences on other apps on the one hand, this ideal of kind of data portability. And on the other hand, making sure that your data's always locked down. Guaranteeing that it never goes anywhere. You know I think we've started off a little bit on the idealistic, and maybe naive side, right, of thinking that that vision around data portability and enabling social apps was gonna be what our community preferred, and I think what we've learned over time very clearly is that the most important thing always is making sure that people's data is locked down. And that's a mistake that ... we fixed a few years back and I don't expect us to make again. Segall: Is your business model on trial here? Zuckerberg: You know, one of the big misconceptions about Facebook is this idea that we somehow sell data. We don't sell any data to anyone and that's actually a really key part of the model. Both for protecting people's personal data and privacy, but also because, you know the competitive advantage of a lot of our services, whether that's ranking News Feed or ranking search or even ranking ads is that people do share a lot of information on Facebook and therefore we can build better services. So we don't want data to be able to get out. When that happens, that's not good for people in our community, that's not good for our business. So, that's not actually how ads work on the service and it actually has never been. An advertiser can come to us and say, "Hey, I'd like to reach women within this age range" and if we understand who is in that then we can show that ad but none of that information goes to the advertiser. Zuckerberg: I think what's clear is that in 2016, we were not as on top of a number of issues as we should have [been] whether it was Russian interference or fake news. But what we have seen since then is, a number of months later there was a major French election, and there we deployed some AI tools that did a much better job of identifying Russian bots and basically Russian potential interference and weeding that out of the platform ahead of the election. And we were much happier with how that went. In 2017, last year, during the special election, the senate seat in Alabama, we deployed some new AI tools that we built to detect fake accounts that were trying to spread false news and we found a lot of different accounts coming from Macedonia. So, I think the reality here is that this isn't rocket science. Right? And there's a lot of hard work that we need to do to make it harder for nation-states like Russia to do election interference, to make it so that trolls and other folks can't spread fake news, but we can get in front of this. And we have a responsibility to do this, not only for the 2018 midterms in the U.S., which are going to be a huge deal this year and that's just a huge focus for us but there's a big election in India this year, there's a big election in Brazil, there are big elections around the world, and you can bet that we are really committed to doing everything that we need to to make sure that the integrity of those elections on Facebook is secured. Segall: Do you think that bad actors are using Facebook at this moment to meddle with the U.S. midterm elections? Segall: Do you know what the -- speaking of getting in front of them, do you know what they are? Zuckerberg: Yes, and I think we have some sense of the different things that we need to get in front of and we have a lot of different folks in the company, both building technology and, a lot of this stuff requires people to review things and that's one of the big commitments that we've made this year is to double the number of people working on security at the company. We're going to have 20,000 people working on security and content review in this company by the end of this year. We have about 15,000 people working on security and content review now. So I think the combination of building the right tools to identify different patterns across all of our products and having people to review them at the scale and speed that we need is going to be a good formula, but you know, security isn't a problem that you ever fully solve. You can get to the level where you're better than your adversaries and they continue evolving, so we're going to be working on this forever, as long as this community remains an important thing in the world. Segall: Are you specifically seeing bad actors trying to meddle with the U.S. election now? Zuckerberg: What we see are a lot of folks trying to sew division. Right? So that was a major tactic that we saw Russia try to use in the 2016 election. Actually most of what they did was not directly, as far as we can tell from the data that we've seen, was not directly about the election, but was more about just dividing people. You know, so they'd run a group for pro-immigration reform and they'd run another group against immigration reform to just try to pit people against each other. And a lot of this was done with fake accounts that we could do a better job of tracing and using AI tools to be able to scan and observe a lot of what is going on and I'm confident that we're going to do a much better job. Now the reality is with a community of two billion people, I can't promise that we're going to find everything. But what I can commit to is that we're going to make it as hard as possible for these adversaries to do that and I think that we're going to do a much better job. Segall: Lawmakers in the United States and the UK are asking you to testify. Everybody wants you to show up. Will you testify before Congress? 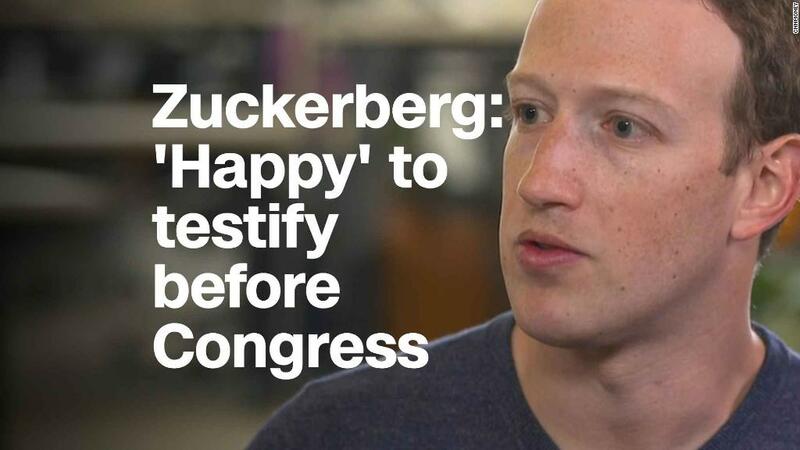 Zuckerberg: So, the short answer is I'm happy to, if it's the right thing to do. Facebook testifies in Congress regularly on a number of topics, some high profile and some not. And our objective is always to provide Congress, who does an extremely important job, to have the most information that they can. We see a small slice of activity on Facebook, but Congress gets to have access to the information across Facebook and all other companies and the intelligence community and everything. So what we try to do is send the person at Facebook who will have the most knowledge about what Congress is trying to learn. So if that's me, then I am happy to go. What I think we've found so far is that typically there are people whose whole job is focused on an area, but I would imagine at some point that there would be a topic where I am the sole authority on and that would make sense for me to do and I'll be happy to do it at that point. Segall: Given the stakes here, why shouldn't Facebook be regulated? Zuckerberg: I actually am not sure we shouldn't be regulated. I think in general technology is an increasingly important trend in the world and I actually think the question is more, what is the right regulation rather than "Yes or no, should it be regulated?" Segall: What's the right regulation? Zuckerberg: Well there's some basic things, then I think there are some big intellectual debates. On the basic side, I think there are things like ads transparency regulation that I would love to see. If you look at how much regulation there is around advertising on TV and print, it's just not clear why there should be less on the internet. We should have the same level of transparency required. And I don't know if the bill is going to pass. I know a couple of senators are working really hard on this, but we're committed and we've actually already started rolling out ad transparency tools that accomplish most of the things that are in all the bills that people are talking about today because this is an important thing. People should know who is buying the ads that they see on Facebook, and you should be able to go on any page and see all the ads that people are running to different audiences. So we actually already have this running in Canada as a test and our goal is to get this running here well before the 2018 midterms, so that way we'll have that new, higher standard of transparency in place for the 2018 midterms in the U.S. There are broader regulation questions as well, but that's actually an easy one. Segall: So you've been the leader of Facebook for 14 years. Looking back on all your time, because we don't get to hear Mark, personal Mark that often, do you have any moments that you look at that are regrets? If you could look at one moment as something you regretted that you really wish now you could have changed or you could have done, what would it be? Zuckerberg: Oh, I don't know. I mean, there are so many mistakes that I've made. I started this company when I was 19. I was a kid. Segall: What do you say to your 19-year-old self in a dorm room? Zuckerberg: I think a pretty common question is "What mistake do you wish you'd not made?" but the reality is you can make a ton of mistakes in your life, no matter what you do and you know, I've made, I've made every kind of mistake that you can make. I mean I started this when I was so young and inexperienced, right? I made technical errors and business errors. I hired the wrong people. I trusted the wrong people. I've probably launched more products that have failed than most people will in their lifetime. But you know I think the thing that makes Facebook work for people, is not that there weren't mistakes; it's that we learned from them. Right, and that's the commitment that I try to have inside our company and for our community is that yeah, maybe you're not gonna get everything right. The world changes. There are gonna be new challenges that come up. Segall: How has being a father changed your commitment to users, changed your commitment to their future and what a kinder Facebook looks like? Zuckerberg: Well, you know I used to think that the most important thing to me by far was, you know my having the greatest positive impact across the world that I can and, now I really just care about building something that my girls are gonna grow up and be proud of me for. And that's what is kind of my guiding philosophy at this point is and you know I come and work on a lot of hard things during the day and I go home and just ask will my girls be proud of what I did today? — CNN's Rob McLean and Danielle Wiener-Bronner contributed.